If the 4th of July weekend put you into a celebratory mood, let those feelings of pride and patriotism boil over into the streets of Boston … the home to so many of those stories that made your eyes bug out when you were a kid. See them all – and more – along the 2.5 mile Freedom Trail that connects a collection of museums, churches, meeting houses, burying grounds, parks, ships, and historic markers that tell the story of the American Revolution and beyond. Preserved by the citizens of Boston in 1958 when “progress” threatened them the demolition, some of the sites are now part of Boston National Historical Park. During the summer, National Park Service Rangers conduct 90-minute daily walking tours at 10 am, 2 pm, and 3 pm along the downtown portion of the trail. 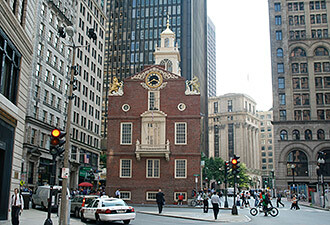 The place names – Old State House, Old North Church – roll easily off the tongue…and evoke memories of American history lessons, the details long-lost, but the importance never forgotten. Done downtown? Head over the Charles River to Charlestown to visit the Bunker Hill Monument that marks the site of the first major battle of the American Revolution. (Little known historical fact: the Battle of Bunker Hill mostly took place on Breed's Hill!) The park museum is open 9-5 and is free. Next stop, Charlestown Navy Yard. From 1800 to 1974, the yard built, repaired, and outfitted U.S. naval vessels. 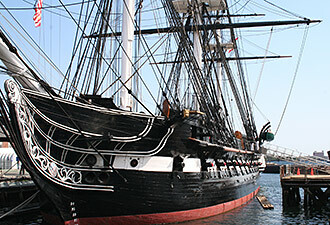 Today it is home to USS Constitution – also known as Old Ironsides – the oldest commissioned warship afloat in the world, and the USS Constitution Museum. The yard and the ship are managed in a partnership between the park and the U.S. Navy. Admission is free. Tours are offered every 30 minutes ending at 3:30 pm Tuesday – Sunday. A thoroughly modern city in every regard, Boston's charming historic side makes for a great refresher course on the birth of our nation. A place where the ideals of freedom of speech, religion, government, and self-determination, were born, nurtured, and so strongly embraced that they inspired a new country. Ours. 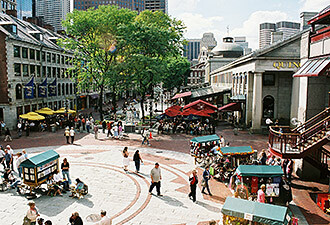 Other national parks in the Boston area: Boston African American National Historic Site, Boston Harbor Islands National Recreation Area, Adams National Historical Park in Quincy, Frederick Law Olmsted National Historic Site and John F. Kennedy National Historic Site in Brookline, Longfellow National Historic Site in Cambridge, Salem Maritime National Historic Site in Salem, and Saugus Iron Works National Historic Site in Saugus.